To stay in the forefront in a competitive environment, it is essential to recognize and utilize opportunities that will give you an advantage in creating growth and sustainability. The prestige of your brand must be upheld and most importantly, it must be accessible. Using innovative and exciting marketing and sales techniques you can significantly impact your brand equity. How Can Premium Brands Leverage Effective and Innovative Marketing and Sales Techniques? One of the newest trends has been the pop-up shop which has significantly helped boost brand equity because they are cool, attention grabbing, provide a unique experience and can be placed where a regular store cannot. But what if you could achieve the same results with a more cost effective solution that removes the headaches associated with managing staff? Premium automated retail machines are the next big thing in consumer marketing; think of them as automated pop up shops. Now is the time for companies looking to grow to jump on this trend and get full and lasting exposure. These completely custom robotic machines allow you to create versatile, specific and unique sales experiences that enhance the image of your brand. Although custom vending machines these kiosks should not be confused with plain old vending machines. or even smart vending machines. Vending machines are mostly electronics and may sometimes have a touch screen. A true automated retail machine has a server, software, enterprise backend and uses robotics to move the products ensuring the dispense is gentle. Interestingly enough, the volume of revenues through an automated retail machine is often 2 to 10 times higher than a vending or even a smart vending unit. The more premium automated stores have all the benefits of pop up shops. including the ability to customize the look and feel so that you can showcase and enhance the style, feel, and voice of your brand. From cars to jewelry, more brands are using Automated retail machines to showcase prestige products. Funding store fronts and hiring sales staff is expensive, and managing them is time consuming. With automated retail machines you can position your products in high priority locations for a fraction of the cost of a pop up shop, increasing profit margins and freeing up capital to expand into additional high traffic locations. The typical monthly cost of leasing and running a luxury automated retail machine works out to about half of a clerk’s monthly salary. Sales staff can be great but can also be a potential liability. As your company grows into multiple locations, so does the challenge of training new hires to reflect the brands integrity and image. Furthermore, turnover of staff is a constant problem. This is an especially large risk for pop-up shops where staff are only on site for a few months or less. Premium vending machines create an elite and exclusive feel. They are in the perfect position of being new enough that they are exciting and fun. They create a truly memorable experience and customers love the instant gratification and the hassle free process. 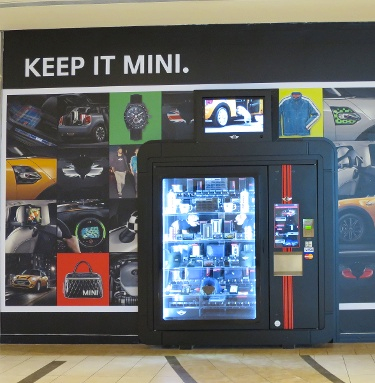 The ease of install and the portability of a custom vending machine makes it possible to position it in high traffic locations to capture additional or new demographics. You can place these within large stores, malls, airports, hotel lobbies, corporate campuses, the options are unlimited. You can promote a specific product or line of products in a targeted area to maximize effectiveness. A jewelry store in a mall might place a unique automated store in another area in the same mall showcasing just gifts, while making customers aware of its other store location. Retailers will often set up a window display in other areas to create awareness, but it is far less effective and as expensive, the automated store actually sells! The days of the vending machine as the simple purveyors of snacks are behind us. In today’s world, premium retail kiosks are transcending the traditional retail experience offering audiences new, exciting and convenient ways to become part of your brand. Contact us today to see how our premium automated retail machines can enhance your growth.